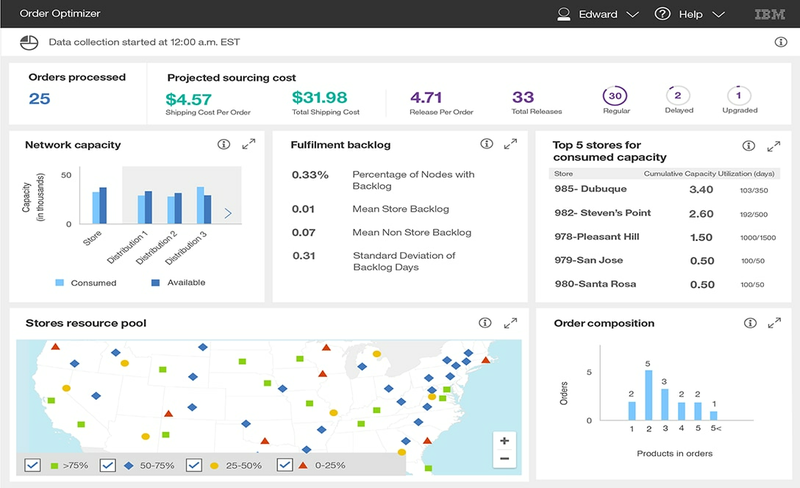 See how you can reduce the total cost-to-serve with last mile intelligent omnichannel fulfillment. Make decisions, take actions, and build experiences that meet customer expectations and drive profitable business across digital and physical store channels with greater confidence and maximum impact. Enables lines of business to execute optimized order fulfillment plans, in real-time, to maximize capacity while reducing shipping costs for increased profit, especially during peak periods. Assists omnichannel fulfillment practitioners in Retail to leverage cognitive science to better understand their customers and drive real-time action. Enable lines of business to easily execute optimized order fulfillment plans at the lowest cost-to-serve resulting in improved omnichannel profitability. Optimize and choose the best sourcing node in real-time to minimize shipping costs. Leverage cognitive science to better understand customers and drive real-time action for improved outcomes for omnichannel fulfillment. Automate the selling process for complex products and services.